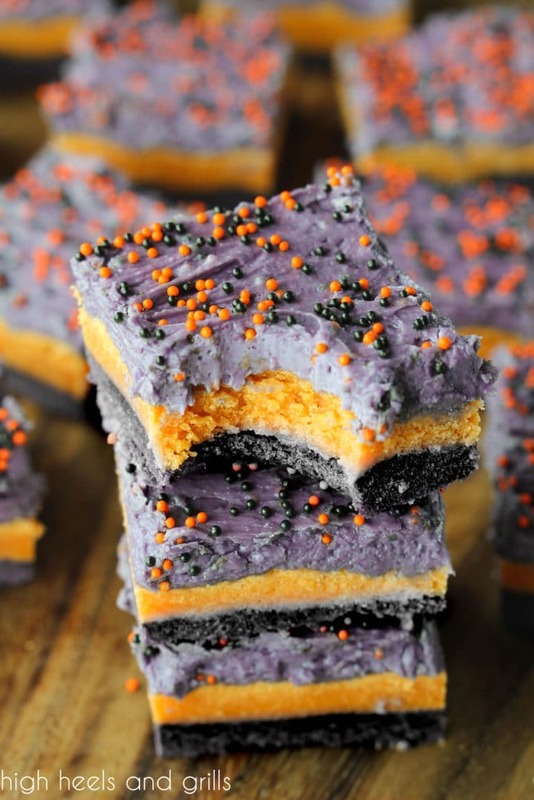 If you need an easy Halloween treat idea, make these Halloween Sugar Cookie Bars! They are so festive, but take such little effort. They would be great for school Halloween treats! I love rolling out sugar cookies, cutting out the fun shapes, and decorating them. It’s so fun and my kids really enjoy doing it with me! But let’s be honest – there is a time and place for that. Sometimes you just need a thick and chewy sugar cookie bar without getting an entire arm workout along with it. 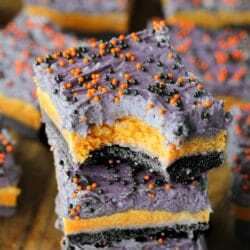 That is why I love these Halloween Sugar Cookie Bars! 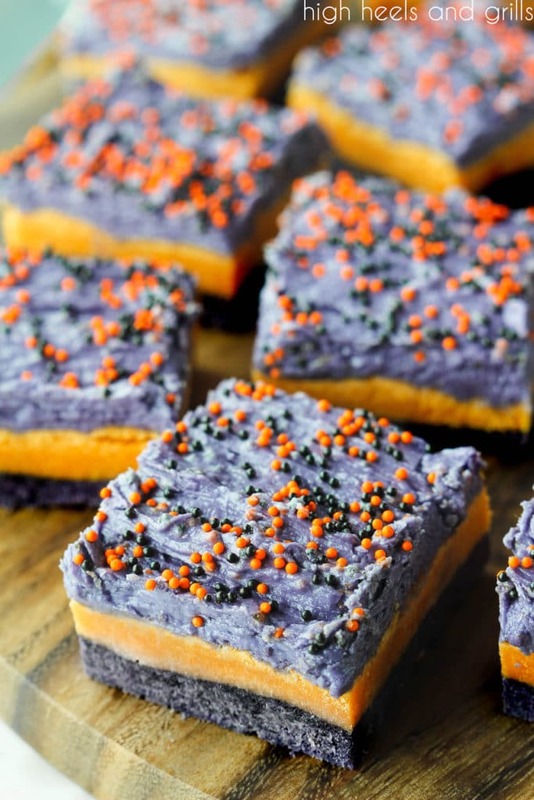 They are a fun and festive variation to my regular Sugar Cookie Bars and would pair well with these Candy Corn Sugar Cookie Bars to make a really fun and easy Halloween treat plate! Add all of the dry ingredients. Split the dough in half and add different food colorings to each half. Spread the dough in a pan, layering the colors. Let cool and spread frosting on top. If you find the dough sticking to your hands, spray a little bit of cooking spray on your fingers to make it easier to spread it all out. Add a little more black food coloring than you think you will need because it will lighten as it cooks. For the orange layer, roughly flatten the dough in your hands before laying it on top of the black layer. This way, you don’t have to spend so much time trying to spread it out. Preheat oven to 375°F and grease a 9×13 inch baking dish. Using an electric mixer, cream together the butter and sugar in a large bowl until light and fluffy; about 3 minutes. Add the vanilla and the sour cream and mix until completely blended. In a medium bowl, combine the flour, salt, and baking powder. Add the dry mixture to the wet mixture 1/2 cup at a time until all of it is added. Separate the dough into two equal parts and color one of the parts black and one of the parts orange. Press the black dough into the baking dish and spread it all the way out to the edges with your hands. Spread the orange dough out a little bit in your hands and then spread it over the black dough. Smush it out evenly, pushing it all the way to the edges as well. Bake for 22-24 minutes or until the edges are just lightly golden. In a medium bowl, cream the butter until smooth. Alternate adding a cup of powdered sugar and a little bit of half and half until it is all used and the frosting has formed. Stir in the vanilla and combine well. Add the purple food coloring until the desired color is achieved. Frost your cooled cookie bars evenly. Add the sprinkles while the frosting is still wet. Love how festive these are just by adding food coloring. Chewy and perfect. My daughter will take these bars with her for a Halloween school party, they look so festive and the colors are so vibrant!